In Part One of this essay I argued that the first two of the South’s objectives were actually met. For at least a hundred years after the war, the great majority of African Americans, even if they were legally free, were unable to control their destinies. They were not slaves, but most could not vote, most could not live where they chose to, and participation in the American Dream remained an abstract ideal. Meanwhile, white supremacy was the dominant, de facto thinking in government, educational and cultural policies. In policing and public safety, of course, it remains so. After the Democrats finally committed themselves in the mid-1960s to full support of Civil Rights, Richard Nixon lured Southern democrats to the Republican side and convinced many Northern white workers to vote against their own economic interests. His success in this strategy showed that the old mythic narrative was still potent. It was still possible – even easy – to divide and conquer the working class by appealing to their fear that they might lose their white privilege. Major financial interests took note and soon bankrolled hundreds of conservative radio and TV stations with their pundits and “shock-jocks.” The massive propaganda of overt fear-mongering and thinly-disguised hate set the tone for our current civic discourse. This has been perhaps the South’s greatest victory. Now the South is as solidly Republican as it once was solidly Democratic. And America remains the only advanced industrial nation without a powerful, organized, working-class political party. What about those other Southern objectives of 1860? It was the South that strongly believed in the establishment and prosecution of American Imperialism. Before the Civil War, much of the leadership for U.S. imperial expansion, first on the North American continent came from Southerners. …the role endless war played in sustaining domestic racism. Starting around 1898, well before it became an icon of redneck backlash, the Confederate Battle Flag served for half a century as an important pennant in the expanding American empire and a symbol of national unification, not polarization. Woodrow Wilson, another Southerner, manipulated the nation into World War One and savagely prosecuted dissenters. 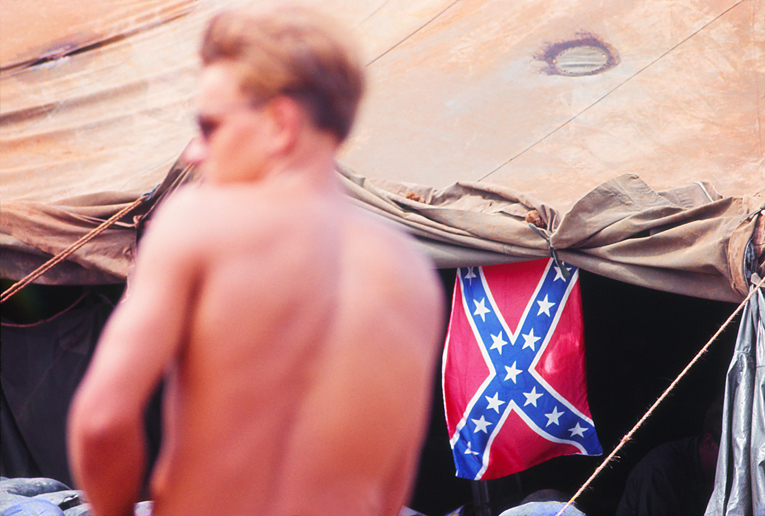 In World War Two, Southern officers carried the Confederate battle flag into combat. After a two-month battle for the island of Okinawa, the first flag Marines raised upon taking the Japanese headquarters was the Confederate one. There, white soldiers celebrated the death of Martin Luther King by raising the Confederate flag and burning crosses. As recently as 2003, American soldiers carried it into Iraq and Afghanistan. In 2016, writes Grandin, “The flag’s current presence in American culture is ubiquitous. It adorns license plates, bumper stickers, mugs, bodies (via tattoos), and even baby diapers.” And once the primary season got into full gear, the flags were a constant presence at Trump rallies. It should be no surprise that Southern politicians are our fiercest warmongers, most of the nation’s military leaders are Southerners, and most of its military bases are in the South. Imperialism is America’s biggest business and has more than made up for the decline of Southern agriculture. In 2015, the United States has military bases in over 150 countries and its expenditures exceed all other nations combined. Consider even deeper implications, how different things might have been. It is at least possible that without the reactionary Southern Republican takeover of Congress and the Electoral College, there would have been no Ronald Reagan, no Bush (I, II or III), no invasion of Iraq or Afghanistan, no demonizing of Muslims, no FOX News, no War on Terror, no War on Drugs, no mass incarceration of black people, no Tea Party and no refusal to heal the wounds of Global Warming. This is not to place all blame on the Republicans; Democrats in Congress regularly played along. But this is the truth: all of the sordid history of the past fifty years has played out because the Southerners’ philosophies of racist imperialism and white supremacy were never excised from our national mythology. Point 4 – Acceptance of “state’s rights” and opposition to centralized federal authority. This is a hugely complicated issue, but I will offer a few examples. Due to gerrymandering and removal of literally millions of blacks from the voting roles, reactionaries dominate at least two dozen state governments. This means that they have permanent control of at least 40% of electoral votes in national elections and majority control of both Senate and House votes. At local levels, this has meant that public education in the South is as segregated as it was in 1954, and access to affordable abortion is almost impossible in half the state s. Today, despite the success of a few celebrities, far fewer black people are eligible to vote than in 1965. On another level, and of more universal consequence, both trust in government and voting rates have plummeted to their lowest numbers ever. These changes are the results of deliberate policy. The Republican agenda – led by Southerners – has been to so corrupt and degrade the political process, public participation and civic engagement and the idea of even voting so fully as to speed up the already existing process of withdrawal from those realms. For whatever reason we choose – from Tea Partiers to progressives – nearly all of us now hate the government. Anyone who doesn’t acknowledge that the Southern agenda of destroying faith in the authority of the federal government (except of course for “Defense” appropriations, potential outlawing of abortion rights and foreign trade – see below) in favor of State’s rights has simply not been looking. It may have taken some 130 years since the end of the Civil War, but the South has succeeded, even if its attempt to secede failed. Now it no longer needs to. 5 – Low tariffs on foreign manufactured goods. In 1860 the South strongly supported low tariffs on foreign manufactured goods while the North wanted high tariffs to protect domestic industrial development. It is so-called “free trade” (e.g., NAFTA and the WTO) that has led to the free export of American capital, its subsequent de-industrialization and the loss of countless jobs. Ironically, millions of under-employed northern workers have moved to the Sun Belt, increasing the populations (and electoral votes) of the Southern states. By the way, it was Bill Clinton, a Democrat and a Southerner, who was most influential in enabling this situation. And today (6/23/15) Senate Democrats allowed the Trans-Pacific Partnership to move one step closer to passage. The South has had its way again. Does facing the truth make us any freer? At this point I have little to offer but a road away from our innocence. The truth is that such dark conclusions are of value only if they inspire us – make us willing – to re-write, or reframe, our history. And this requires the ability to think mythologically. Perhaps our national story – not the official story of freedom and opportunity, but the actual one, the one that acknowledges that the South really did win the Civil War – is losing its hold on us. But because the new story has not been written yet, we are all living in liminal times, an initiatory period that produces increasing stress. The bad news is that this condition will certainly give us more Dylann Roofs, that more innocents will suffer. Thinking mythologically allows us only one privilege: to entertain the possibility that the new story may well be in its birth stages. As Wendell Berry writes, Be joyful though you have considered all the facts.